Teddy Wares and Flutterbies: WOYWW Tempus really fugits! Seems just like yesterday that I was posting last week's WOYWW. If you don't know what I'm talking about, pop over to Julia (see below) to see what it's all about. The week has flown partly because I've just got home from 4 days with my 88 year old Mum. I always have to take some crafting to do, and managed to finish this Summer Days Baby Blanket, to go on the 'for sale' pile. It's made with the lovely bright 5 ply cotton from Lidl - I love working with that yarn. Since getting home this afternoon, I've been recovering from the 3.5hr drive by knocking up a couple of stash-busting cotton dish cloths. I used a couple of balls of cotton that I've inherited along the way which are quite fine but ok when worked together. One ball is white, and the other pale green, but - sorry - you can't really tell from either of these pics, one using the flash and one without. 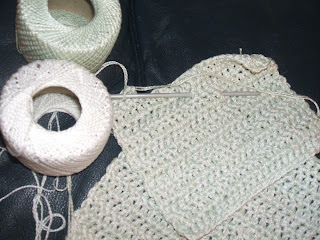 Tomorrow (Wed) I'm off to buy yarn to knit a Ravelry poncho for Mum. She feels the cold these days, and wears a shawl that she's always having to pull up over her shoulders - hopefully this will make life a bit easier for her. I'm posting this over with Julia at http://stamping-ground.blogspot.co.uk/2013/02/whats-on-your-workdesk-wednesday-194.html so why not make a cuppa, put your feet up and pop over to see what everyone else has been up to. Pretty baby blanket, glad you had time to rest up from the drive. Same distance to my sons and it's a while before I get back to normal. Thanks for popping by last week, I had computer problems so didn't visit many. Enjoy WOYWW, and happy crafting. Gosh you have been busy. Your baby blanket is so cute. 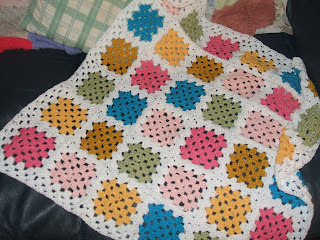 What a lovely blanket such pretty colours and I am sure your mum enjoyed your company. Love the blanket and dish towels. The Poncho will be grand. 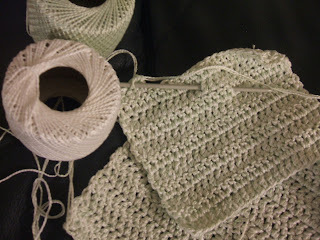 The baby blanket is lovely, I haven't done that stitch in years. I wasn't the big crocheter that the rest of my family were and are (so many have past away that I have to use both words) Love the cotton crocheted dish cloths, they are simply the best. My you do work fast, like my Mom used to do. Your baby blanket is lovely and I am sure your mum will be glad of a poncho. You will have to post it when you complete. That is a really cute baby blanket. Maybe I should start one for our annual blanket Mass. 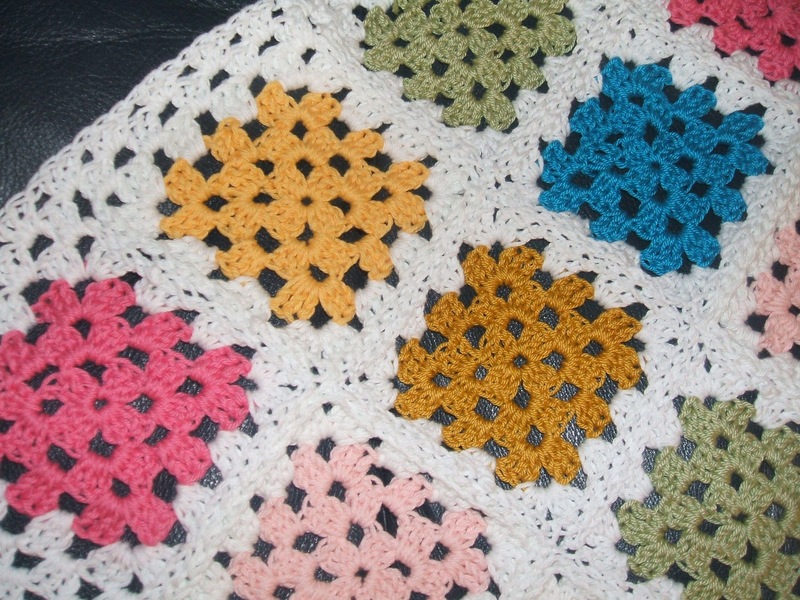 A baby blanket doesn't seem so daunting. 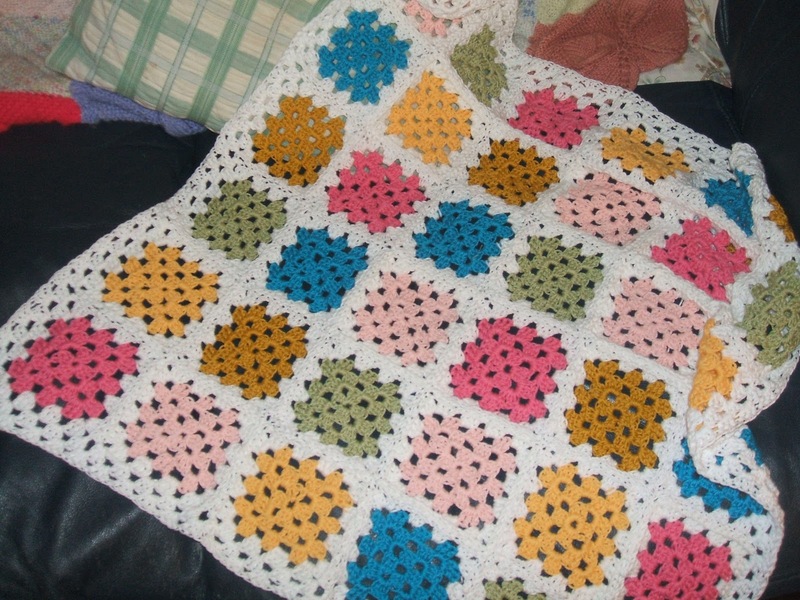 Pretty baby blanket and the crochet cloths are always handy to have. Have a lovely crafting week! Nice blanket and those colors are just so appealing. A shawl for mum is a great idea!